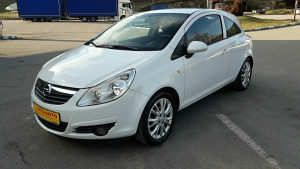 OPEL CORSA D 1.2 BENZIN/PLIN, 59 KW/83 KS ! VOZILO JE U PERFEKTNOM STANJU, MAKSIMALNO UTEGNUTO I OČUVANO, ŠTO SE VIDI I NA SLIKAMA, POSJEDUJE BOARD COMPUTER, KLIMU,KOMANDE NA VOLANU, MAGLENKE NAPRIJED/NAZAD, ALU FELUGE, 2 KLJUČA, NOVE GUME ! TEK UVEZENO I PLAĆENE SU SVE OBAVEZE DO REGISTRACIJE ! VIŠE INFORMACIJA NA BROJEVE 066/834-491 MILAN ILI 065/529-208 BRANKO !